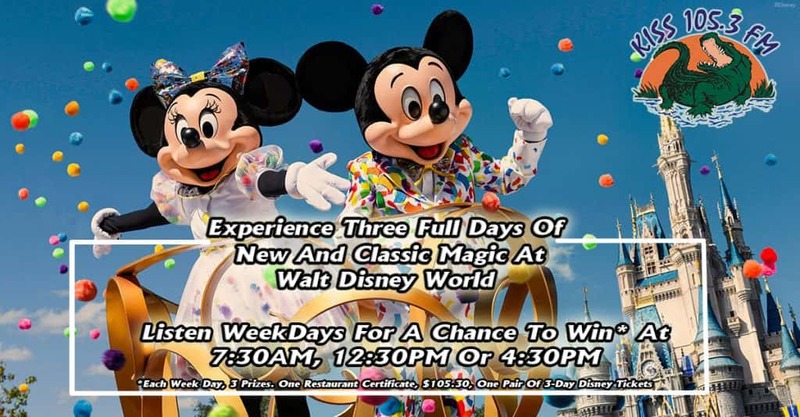 You could win Florida Resident 3-Day Discover Disney Tickets from KISS105! Sure, you’ve ridden the mountains and met the Characters, but if you haven’t been to Walt Disney World® Resort lately, you haven’t been. And with four Florida Resident 3-Dday Discover Disney Tickets, your family can experience three full days of new and classic magic. Join the party at the all-new Mickey & Minnie’s Surprise Celebration at Magic Kingdom® Theme Park. See what’s budding at the Epcot® International Flower & Garden Festival. Play big at the new Toy Story Land in Disney’s Hollywood Studios. And journey to the awe-inspiring Pandora – The World of Avatar in Disney’s Animal Kingdom® Theme Park. There’s more to see, do, taste and experience than ever before and no better way to experience it than with the Florida Resident 3-Day Discover Disney Ticket! Disclaimer: Ticket valid now through 6/30/19. One theme park per day. Proof of Florida residency required. Ticket is nontransferable and non-refundable and excludes activities/events separately priced.